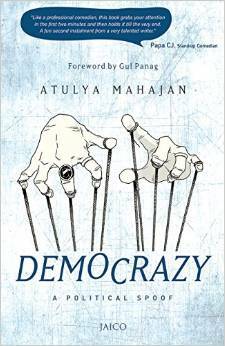 Atulya Mahajan takes you on a roller coaster ride with the politics of the day in a satire that you will enjoy till the last page of the book is turned. Aptly titled Democrazy, it is the story of how the mighty and the powerful take the voting gullible public at large for a ride and continue to play God. I think the book is a classic representation of the electoral politics that we call ourselves as democracy. Except its actually the crazy with the ‘z’ which makes it true. For all its goodness and its superlative ability to uphold the citizens right, democracy can be take to task if you are skillful and more importantly know how to play it right. The book has an array of characters which I am sure you can easily identify with, make a pardon there is a disclaimer boss that its all the authors imagination. There is the Badi Sarkar who wants the Chote Sarkar to be the PM, dont guess who it is, bit the fact is Chote Sarkar is interested in eating icecreams of different flavours. The characters of the book come straight out of entertainment industry if you ask me especially the news with a nation anchor BB who wants to know everything under the sun relegating the Saas bahu serials to the back burner for the active and know all citizens who want to know it all. There is a social media activist on twitter who helps his mother get out of an incedent, and then there is a big capitalist all get together to get the democracy working like crazy. All of them have a goal and that is power never mind it corrupts absolutely. The people taken for a ride across is not significant because they are made ready to be taken for a ride! With elections in the background and the cacophony of speeches barbs and counter barbs and also the trp hungry TV shows its a classic mockery of the democratic traits that we harbour as sacred. This is very well set in Indian background and for once after a long time that the election is over I am wondering if the book is a true story! Highly recommended for a dutiful citizen so that he will be convinced to take off on the election day as if his voting mattered!